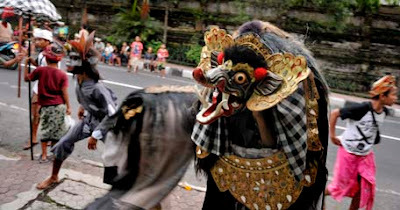 Come on holiday to Bali and enjoy the beauty of Barong Bangkung being "Ngelawang" or street dance performances paradise. When you vacation in Bali you can not only enjoy the natural beauty, culinary, hunting souvenirs typical of Bali, you can even buy the product well-known fashion designers, and of course the art of Balinese culture. You can watch Kecak dance, art architecture which you can meet at the home and especially when you visit the of Pura or Balinese Hindu Temple. Bali has many ceremonial activities according to the culture and customs of Bali, which is based on the Hindu religion. There are many local holidays in Bali other than the official national holiday. If you were in Bali when the celebration of Galungan and Kuningan, then you can watch the Tari Barong Bangkung. Unlike the Barong Dance that you can see every day in Batubulan or some other place, it turns out Barong Bangkung performed only on certain holidays, especially on the second day of Galungan and Kuningan. Their activities are called "Ngelawang" or doing street performances to entertain the public on a traditional holiday in Bali. Barong Dance Bangkung not require special stage. The dancers and musical accompaniment will be round about in the village. Ngelawang or circumference around the village, and even to neighboring villages or on the hall or in your backyard or on the roadside. The community enthusiastically watched them, and there are a lot of people will give them a dime and rich people will give them a pretty good tip. TIf your vacation to Bali on a feast of traditional Balinese, especially in Galungan and Kuningan, then you can enjoy the street performances of Barong Bangkung, and you will enjoy "Ngelawang", a very unique tradition in Bali.